Peter Ianniello on the business he co-owns with Red Sox legend David Ortiz. When Arias Wine co-owner and former Boston Red Sox slugger David “Big Papi” Ortiz hit home runs, he was known to point towards the sky in honor of his mother, Angela Rosa Arias, who passed away in a tragic car accident in 2002. This gesture would end up inspiring the logo for Arias Wine, which he named after his late mother. 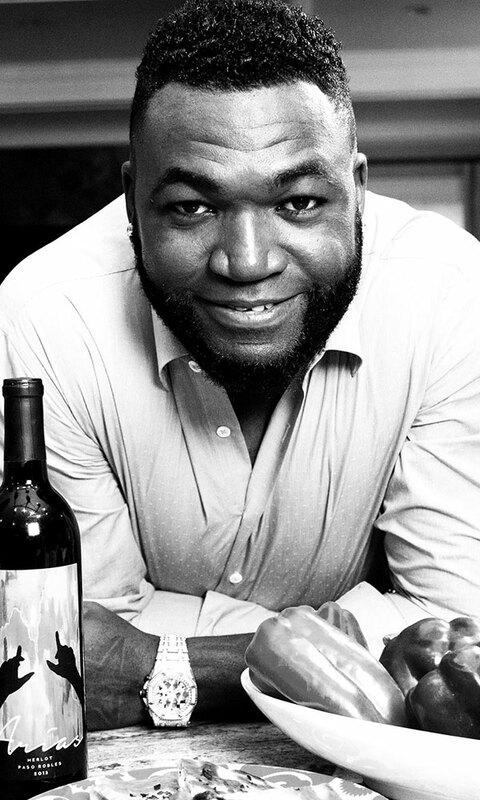 Red Sox legend and co-owner of Arias Wine, David ‘Big Papi’ Ortiz. “Within every great wine there’s a great story,” says Peter Ianniello, Ortiz’s business partner. For example, one of Arias’ signature bottles, Cristalan, was inspired by a statue in Yaddo’s Rose Garden. The statue, which is also gesturing upward, was constructed to commemorate Katrina Trask’s four children, none of whom lived past the age of five, and her late husband, who died in a train accident. Ianniello sees a common thread between Trask’s and Ortiz’s approach to bereavement: After losing her family, Trask threw herself into the creation of the Yaddo artists’ residency program; and when Ortiz lost his mother, he started Arias Wine and launched The David Ortiz Children’s Fund, a nonprofit organization committed to providing critical pediatric services to children in New England and the Dominican Republic. “It’s through the pursuits of passion that we overcome grief and rise above adversity,” Ianniello says. Saratogians interested in tasting the fruits of this passion can find Arias Wine at a handful of local restaurants, including Max London’s, Osteria Danny and Druthers Brewing.